Part of the joy of planning your wedding is about being creative, and your creativity begins with planning what style of save the dates you will send your friends and family. 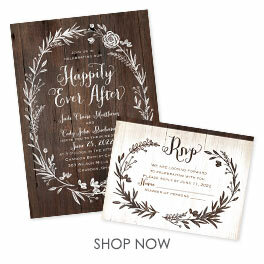 Photo save the date cards by Ann's Bridal Bargains are one of the best ways to share your good news. Customize these save the dates with your engagement photos, then design the rest of the announcement with your choice of fonts, colors and styles. A picture is worth a thousand words, right? So why not keep your save the dates simple and let photos do the talking! Plus we know you have some favorite pictures you want to make sure friends and family see. Even though we offer plenty of save the date cards designed for multiple pictures, we also encourage you to take a look at our collection of photo wedding invitations.They’re perfect for sharing even more of your awesome engagement photos.